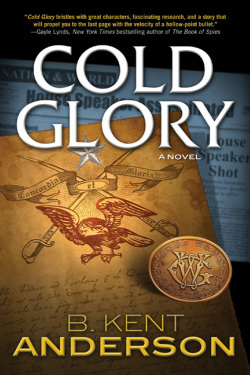 Cold Glory - Doug Grad Literary Agency, Inc. The Civil War is ending. Robert E. Lee’s Confederate Army has finally been overwhelmed by the superior numbers of Ulysses S. Grant and the Union forces. The Confederacy’s days are numbered. At Appomattox Court House, Virginia, Lee agrees to meet with Grant to discuss terms of surrender. For a short time the two generals are alone in the appointed room…no staff, no attendants, no messengers—except for one man, a shadowy figure who has wound his way through both Northern and Southern lines for many months. When the doors finally open, the staffs and witnesses enter and Lee officially surrenders. A single rider—the mysterious man who was just with the two generals—wearing neither blue nor gray uniform, leaves Appomattox seconds later carrying a document bearing the signatures of Grant and Lee. Traveling by horse, train and steamboat, he arrives in the wilderness of Indian Territory three weeks later. At small, isolated Fort Washita, he meets two soldiers – one Union, one Confederate – and delivers the sealed document. The two soldiers take the message, then one pulls his pistol and shoots the messenger dead. The United States is in a precarious position. Terrorism, unchecked budget deficits, an economy on the brink of collapse…major news media begin to refer to a time of “national crisis.” Calls for President James Harwell to resign increase daily. The Congress can barely function, mired in partisan gridlock. Even the courts no longer seem effective, wracked with corruption and inefficiency. Far from the seats of power, near a tiny Oklahoma town, a construction project begins. Workers excavating near the Fort Washita state historic site make an astounding discovery: thousands of weapons, buried deep in the ground. The guns, and papers found alongside them, are sent to a local university for analysis. History professor Nick Journey reads the papers and is stunned at their contents—a document that could change the face of the United States today, nearly 150 years after it was written. Under the pseudonym David Kent, B. Kent Anderson authored Department Thirty (2003), The Mesa Conspiracy (2005), The Blackjack Conspiracy (2005) and The Triangle Conspiracy (2006), all published by Pocket Star Books. The Blackjack Conspiracy received the Oklahoma Book Award for Fiction in 2006. In addition to these publications, Mr. Anderson has had a thirty-year career as a broadcaster and more recently, a magazine journalist. In January 2009, he received two awards for magazine feature writing from the Society of Professional Journalists. B. Kent Anderson lives with his three sons in Oklahoma City.